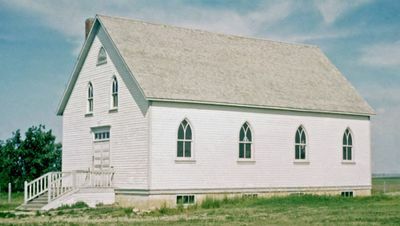 In 1912, 15 pioneer Mennonite settler families organized as the Bergfeld Mennonite Brethren Church (Bergerfeld Mennoniten Brüdergemeinde), located at Bergerfeld, Saskatchewan. The name was later changed to Greenfarm Mennonite Brethren Church when the location was renamed Greenfarm. Greenfarm is located in the Rural Municipality of Morse, No. 165. For the first six years the congregation met in the local Greenfarm School building at NE-22-17-10-w3rd. The first pastor was Jacob W. Thiessen who lived in the district and had previously been ordained. In 1917 a revival took place and 20 members were added to the church, resulting in the congregation building its own building at SW-23-17-10-w3rd (coordinates: 50.356, -107.150 [50° 21′ 21″ N, 107° 9′ 00″ W]) in 1918. This is about 12 kilometres (7½ miles) south east of the town of Herbert, Saskatchewan. The first baptism was in 1913 and in 1914 a Sunday school extension program was opened at the Rosefarm School, some six and a half kilometres (four miles) west of the Greenfarm School building. The congregation had an active choir, Jugendverein, ladies aid, and in the late 1930s and 40s had a Männerverein to serve with music and song. The congregation was part of the Herbert Kreis (South Saskatchewan District) of the Canadian Conference of Mennonite Brethren Churches. The late 1940s brought many changes with better roads and employment opportunities, resulting in many people leaving Saskatchewan or moving into towns, thus decreasing membership. At a regular business meeting in 1961 the congregation decided to formally close in 1962 and invited its members to join the nearby Herbert Mennonite Brethren Church, which most did. Ministers who served the congregation include: Jacob W. Thiessen (1868-1933), served 1912-1927; Johann J. Thiessen, served 1943-1961 (Thiessen was the first secretary of the Canadian Mennonite Board of Colonization); N. Janz; John D. Goertzen; Isaak P. Penner; George Penner; Henry Voth; John Guenther; Herald Thiessen; Peter S. Thiessen; and Jacob Voth, the last pastor. Other church workers included Abe Toews, missionary to French West Africa. The cemetery which was adjacent to the church building is still in use and maintained. Bauer, Jean Penner. "Memories: Greenfarm Mennonite Brethren Church." Jean Penner Bauer, 2005: 202 pp. Herbert Mennonite Brethren Church 1905-1980. Herbert, SK: Mennonite Brethren Church, Herbert, Saskatchewan, 1980: iv, 61 pp. Toews, John A. A History of the Mennonite Brethren Church: Pilgrims and Pioneers. Fresno, CA: Board of Christian Literature, General Conference of Mennonite Brethren Churches, 1975. Available in full electronic text at: https://archive.org/details/AHistoryOfTheMennoniteBrethrenChurch. Details of burials of the Greenfarm Mennonite Brethren Church Cemetery are found at: http://www.rootsweb.ancestry.com/~cansacem/greenfarm.html. Wiebe, Victor G.. "Greenfarm Mennonite Brethren Church (Herbert, Saskatchewan, Canada)." Global Anabaptist Mennonite Encyclopedia Online. September 2014. Web. 19 Apr 2019. http://gameo.org/index.php?title=Greenfarm_Mennonite_Brethren_Church_(Herbert,_Saskatchewan,_Canada)&oldid=163442. Wiebe, Victor G.. (September 2014). Greenfarm Mennonite Brethren Church (Herbert, Saskatchewan, Canada). Global Anabaptist Mennonite Encyclopedia Online. Retrieved 19 April 2019, from http://gameo.org/index.php?title=Greenfarm_Mennonite_Brethren_Church_(Herbert,_Saskatchewan,_Canada)&oldid=163442. This page was last modified on 9 March 2019, at 03:22.